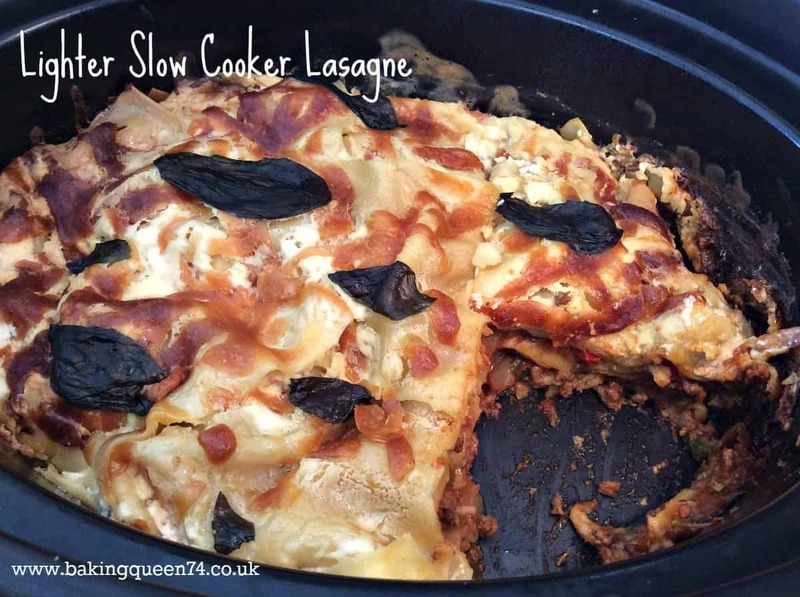 Slow cooker lasagne is a real family favourite in my household. My recipe is a lighter lasagne without a tonne of cheese sauce and with lots of vegetables in it. This suits my family as one child doesn’t like cheese and us adults try to eat more healthily when we can. So if you need a healthy option which the whole family will love, this is ideal. 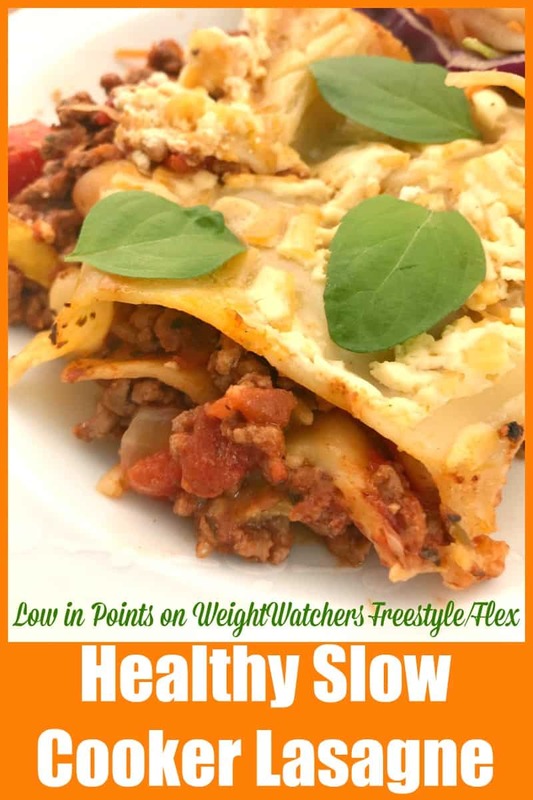 Once I found out how easy it is to make lasagne in the slow cooker, I now make it again and again as it seems much easier than making it in the oven! How Do You Make Lasagne in a Slow Cooker? It’s really very simple. Make up your meat or bolognese sauce as you would in a pan on the hob/oventop, but then you do not need to cook the bolognese sauce through completely before layering it up as you would if you were going to bake the lasagne in the oven. Instead, brown off your meat, then add the rest of the bolognese ingredients to the pan, then layer it up in the slow cooker with your lasagne sheets and cheesy topping. Cook for around 6 hours on low. So this is great for busy people with families or who are busy at work! You might worry that the meat sauce won’t be as flavourful as when it is cooked on the hob first, but in fact I find that slow cooking the whole lasagne in the pot brings out the flavours just as well! How Long Does it Take to Make Lasagne in a Slow Cooker? I cook lasagne in the slow cooker on low for 5-6 hours, but you could also cook it on high for 3-4 hours instead. 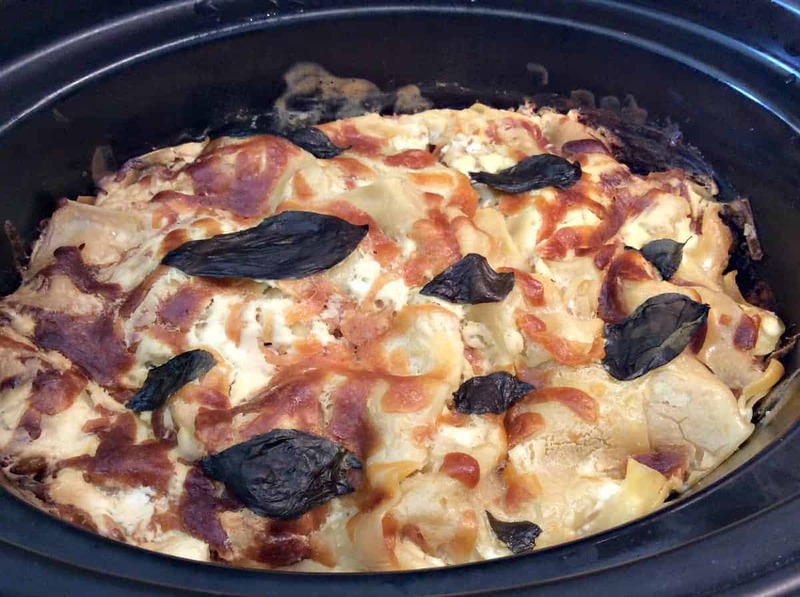 Does the Top of a Slow Cooker Lasagne Go Brown and Crispy? Surprisingly, it does, as you can see in the photos. 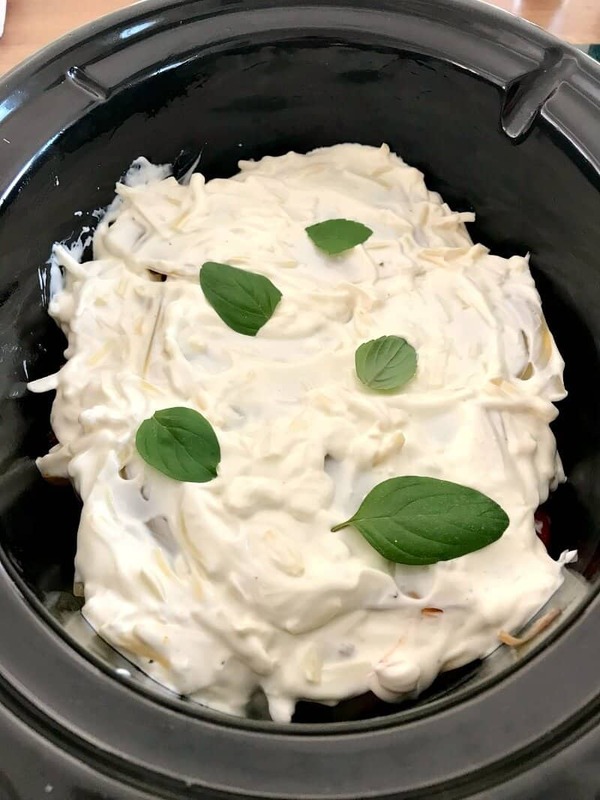 Contact with the sides of the slow cooker cause the cheese topping to brown all on its own, without needing to put it under the grill/broiler. 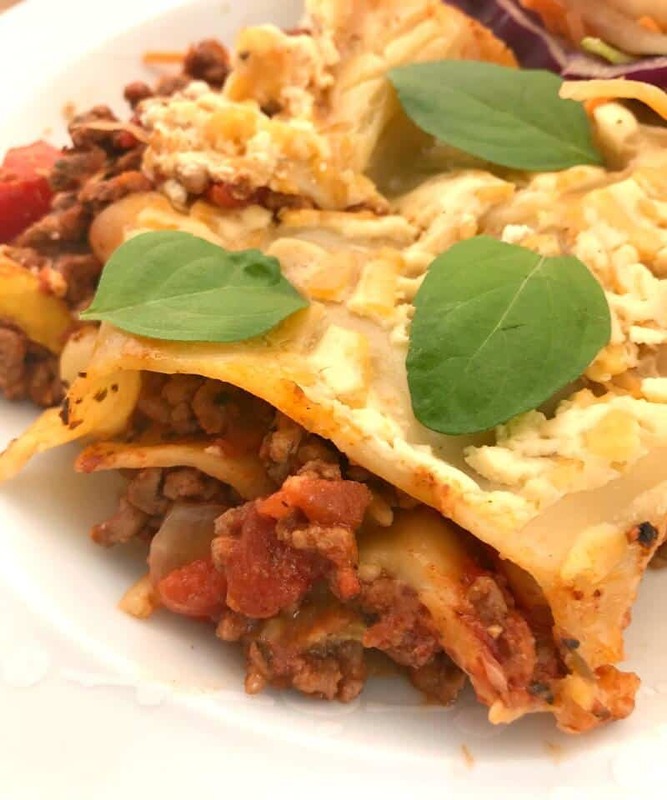 As this is a lighter version of lasagne with less cheese to reduce the calories, it could go even more brown and crispy if you wanted to go mad and add more cheese! As this lasagne is just topped with a quick and easy to make cheese sauce made from creme fraiche and grated cheese, and I only add it on the top layer, it holds together well and can be transferred into another dish for freezing or just storing in the fridge, if you have any leftovers. Check out my Slow Cooker archives for loads more slow cooker recipes suitable for families, including lots of desserts. Brown the beef mince in a pan, without using oil. Once it is brown all over, stir in the onion, red pepper and green pepper. Add the dried oregano and the dried rosemary, the tin of chopped tomatoes and four tablespoons of tomato purée and mix well. Put one third of the mixture in the base of the oiled slow cooker pot. Top with three sheets of lasagne, broken to fit. Put another third of the mince mixture on top of the lasagne sheets, and top again with three lasagne sheets, broken to fit. Repeat once more to use up all of the mince mixture. Mix the reduced fat creme fraiche, grated mozzarella and a splash of milk in a small bowl. Pour it over the top layer of pasta and spread it around to cover the top. Add a few leaves of fresh basil. I used my large 5.7 litre slow cooker for this dish. This dish comes in at only 374 cals per serving (based on 4 portions). Such an great way to make a lasagne which can be a hassle to make the usual way. Love the lighter version aspect too! I found the whole process a lot easier this way! What a great idea, I must try making this. I am a fan of yoghurt in lasagne so will be happy to try a creme fraiche version too. Great news, my youngest doesn’t seem keen on much dairy but she will have this.